Combine all filling ingredients in a (approx.) 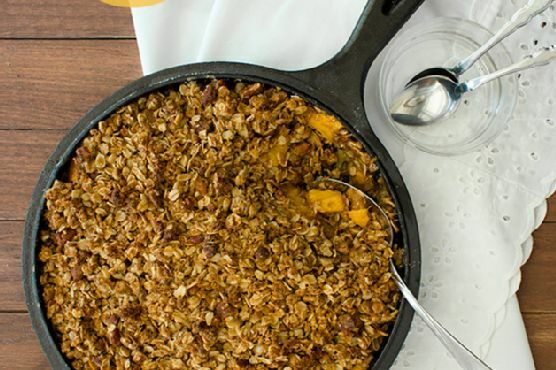 10" cast iron skillet* and toss together until well-mixed. Set aside. In a bowl, whisk together the oats, pecans, pastry flour, brown sugar, cinnamon, and salt for the crumble topping. Add the coconut oil and vanilla and mix in until all the dry ingredients are evenly moistened and the mixture is crumbly.Sprinkle the crumble mixture evenly over the fruit filling in the pan. Bake in preheated oven for 30-35 minutes, until the top is golden and the filling is bubbling up around the edges of the pan. Cool briefly and serve warm, with ice cream or whipped cream if desired. Leftovers can be kept covered in the refrigerator and reheated in the microwave as desired.